Missed Opportunities: Pregnant and Parenting Youth Experiencing Homelessness in America details the unique challenges faced by young people experiencing homelessness who are pregnant or parenting. Our findings suggest that many of the nearly 4.2 million adolescents and young adults in America who experience some type of homelessness during a 12-month period are pregnant or young parents. Many of those young parents are homeless with their children, and pregnant and parenting youth experiencing homelessness are a particularly vulnerable population. Supporting these young people and their families is critical to ending homelessness among youth in the U.S. Eventually, the young family was accepted by a transitional housing program, but had to wait two months before moving in. During that time, John and Cassidy worked while Matthew attended Head Start. The couple said that they have benefitted from the housing program’s individual and group therapy services and its employment supports helped them find jobs. Today they are building their savings so they can move into permanent housing. This Research-to-Impact brief is the third in a series that draws on multiple research components from Voices of Youth Count. Adolescence and young adulthood represent a critical developmental window. Every day that young people like Cassidy and John experience the stress of housing instability represents a missed opportunity to support their healthy development and promote successful transitions to adulthood. Voices of Youth Count elevates the voices of young people like John and Cassidy across our nation who lack the necessary resources to achieve independence and make their unique contributions to society. Throughout this brief, we highlight key findings and new evidence on youth experiencing homelessness who are pregnant or parenting. Our research shows that the number of youth who are homeless and also pregnant or parenting is substantial. Furthermore, many of these young parents are homeless with their children. These young people and their families are a particularly vulnerable population. Coping with pregnancy and parenthood is difficult for any young person. For pregnant and parenting youth who are homeless, those challenges are compounded by the trauma they have experienced and the ongoing stress of not having a safe or stable place to live with their children. • Pregnancy and parenthood are common among youth experiencing homelessness. • A substantial number of young parents experiencing homelessness have their children with them. • About 1.1 million children have a young parent who experienced homelessness in the past year. • Youth experiencing homelessness often seek support during pregnancy and after they become parents. • Relatively few homeless service providers serve minor parents. • It can be difficult for young families experiencing homelessness to maintain relationships while receiving services. • Pregnancy and parenthood may increase the risk of youth homelessness. This research indicates that many pregnant and parenting youth are experiencing or at risk for homelessness. It also highlights opportunities for increased outreach and intervention by homeless service providers and organizations that serve young families. Coping with pregnancy and parenthood is difficult for any young person. For pregnant and parenting youth who are homeless, those challenges are compounded by. . .the ongoing stress of not having a safe or stable place to live with their children. Regardless of their age, most parents experiencing homelessness need some assistance to find and maintain stable housing for themselves and their children. However, pregnant youth and young parents require additional services and supports that are tailored to their developmental needs. They may have little or no experience living on their own, may find themselves unprepared for the responsibilities of parenthood, and may still be working through the challenges associated with adolescence and early adulthood. 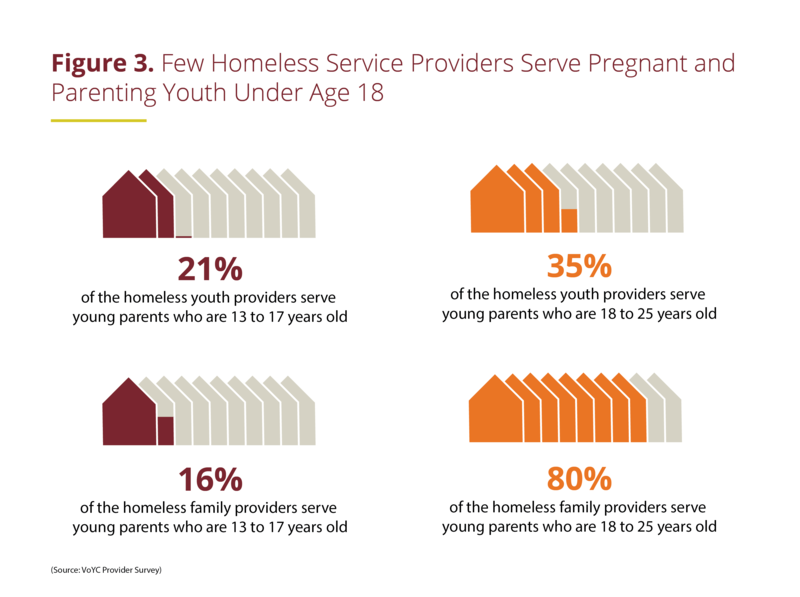 To prevent and end homelessness among youth in America, we must address the unique needs of pregnant and parenting youth who experience homelessness. Otherwise, we risk missing opportunities to ensure that pregnant youth, young parents, and their children have the resources they need to reach their full potential. Voices of Youth Count identifies implications and makes recommendations for policymakers, leaders of public systems, and practitioners. We see these recommendations not as an end point, but as the beginning of a dialogue about tangible changes to the nation’s laws, regulations, systems, and programs. Voices of Youth Count speaks to the evidence while seeking solutions. Address the sexual and reproductive health needs of youth experiencing homelessness by adapting evidence-based pregnancy prevention programs and providing contraception plus prenatal and postpartum care in nontraditional settings. See Finding 1. Increase collaboration between homeless service providers and providers in other systems, including early childhood, early intervention, education, and welfare. See Finding 2. Explore opportunities for family reunification, relationship building, and service engagement with youth experiencing homelessness who are pregnant or parenting. See Finding 3. Develop the capacity of both homeless youth service providers and homeless family service providers to serve all young parents who are homeless regardless of their gender, age, or marital status. See Finding 4. Design programs that recognize the importance of the relationships pregnant and parenting youth have with partners and coparents. See Finding 5. Assess the risk for homelessness among pregnant and parenting youth and refer high-risk youth for appropriate services when they are identified. See Finding 6. • National Survey. A nationally representative phone-based survey of 26,161 adults about homelessness and couch surfing among youth and young adults in their households during the past year and follow-up interviews with a subsample of 150 respondents who reported any youth homelessness or couch surfing. • Youth Counts & Brief Youth Survey. A brief youth survey of 4,139 youth experiencing homelessness conducted in conjunction with point-in-time counts in 22 counties across the country. • Continuums of Care & Provider Survey. Surveys of 523 diverse service providers and 26 Continuum of Care (CoCs) leads in the 22 Youth Count counties. • In-depth Interviews. Detailed qualitative and quantitative interviews with 215 young people experiencing homelessness in five of the 22 Youth Count counties. • Administrative Data Analysis. Analysis of administrative data from multiple sources including the Homelessness Management Information System (HMIS) that all HUD-funded homeless services agencies and organizations are required to use; OrgCode, Inc. intake assessment and homelessness systems data; U.S. Department of Education data on student homelessness; and data from the Foster Care Data Archive—a longitudinal data warehouse containing records for children in over two dozen states who spent time in foster care. • Systematic Evidence Review. A comprehensive synthesis of evidence on programs and practices from evaluations of interventions to prevent or youth homelessness or improve the outcomes of homeless youth. • Policy & Fiscal Review. Analysis of statutory and regulatory entry points for policy action on youth homelessness and group discussions with 25 stakeholders representing youth-serving systems including child welfare, juvenile justice and education from five of the 22 Youth Count counties. 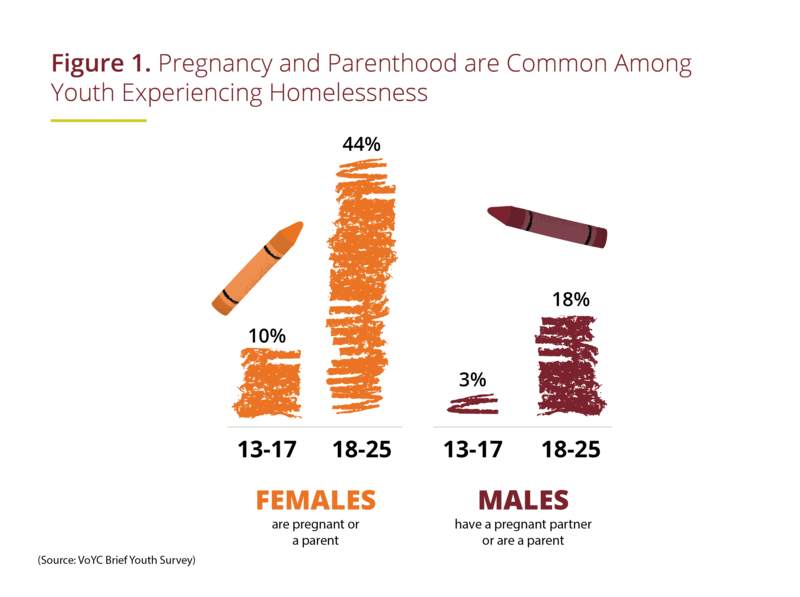 Data from both the brief youth survey and the national survey indicate that a large number of youth experiencing homelessness are pregnant or parents. This is especially true for young women. Forty-four percent of the young women, ages 18 to 25, who completed the brief youth survey reported being pregnant or a parent. By comparison, 18% of the young men in that same age group reported being a parent or having a pregnant partner. Not surprisingly, those percentages were considerably lower among the minors in the brief youth survey sample. Ten percent of the 13- to 17- year-old females reported being pregnant or a parent and 3% of the 13- to 17- year-old males reported having a pregnant partner or being a parent. The prevalence of parenthood was also high among young adults who had experienced homelessness within the past year in our national survey sample. Overall, 43% of the 18- to 25-year-old young women and 29% of the 18- to 25-year-old young men reported having at least one child. By comparison, 22% of young women and 14% of young men who had not experienced homelessness during the past year reported having at least one child. The high rates of pregnancy and parenthood among youth experiencing homelessness stand in stark contrast to the dramatic decline in pregnancy and birth rates among both adolescents and young adults in the U.S. over the past two decades.1 While our data cannot explain why the rates of pregnancy and parenthood are so high among youth experiencing homelessness, they do highlight several potential areas for prevention and intervention. Youth experiencing homelessness would benefit from evidence-based pregnancy prevention programs that are tailored to their needs. Few, if any, of the evidence-based pregnancy prevention programs have been tested with youth experiencing homelessness. Testing these programs is important because existing programs may be difficult to implement in the types of settings where those youth can often be found (e.g., shelters, drop-in centers, street outreach locations). Additionally, the programs may not be trauma informed, and may not seem relevant to youth who are sometimes forced to engage in sexual behaviors in exchange for food, shelter, or other basic needs as part of their survival strategy. Rather than developing new pregnancy prevention programs, programs that are already evidence-based could be adapted for use in settings that serve youth experiencing homelessness. One solution might be to leverage the U.S. Department of Health and Human Services (HHS) Personal Responsibility Education Program (PREP). PREP grantees replicate or adapt evidence-based programs that educate youth about contraception and abstinence to prevent pregnancy and sexually transmitted infections and youth experiencing homelessness are one of PREP’s target populations. Youth experiencing homelessness need access to free or low-cost sexual and reproductive health care services, including contraception. Some street outreach programs already make condoms available to youth experiencing homelessness. However, youth also need access to, and education about, more effective forms of contraception—especially long-acting reversible methods. Because lack of insurance may prevent some youth from accessing sexual and reproductive health care, another solution is to ensure that youth experiencing homelessness have health insurance. Youth experiencing homelessness would benefit from evidence-based pregnancy prevention programs that are tailored to their needs. Few, if any, of the evidence-based pregnancy prevention programs have been tested with youth experiencing homelessness. Additionally, pregnant girls and young women experiencing homelessness need access to prenatal and postpartum care to reduce their risk for pregnancy complications and negative birth outcomes, such as premature and low birth weight babies. One way to increase access is to provide sexual and reproductive health care in nontraditional settings frequented by youth experiencing homelessness, such as shelters or drop-in centers. Increasing access to sexual and reproductive health care won’t reduce pregnancy and parenthood among youth experiencing homelessness if health care providers are not credible, trauma informed, and respectful of the choices youth make regarding their sexual and reproductive health. Homeless youth service providers could offer training on working with youth experiencing homelessness to providers of sexual and reproductive health care. One area that warrants further exploration is how young women experiencing homelessness view pregnancy. 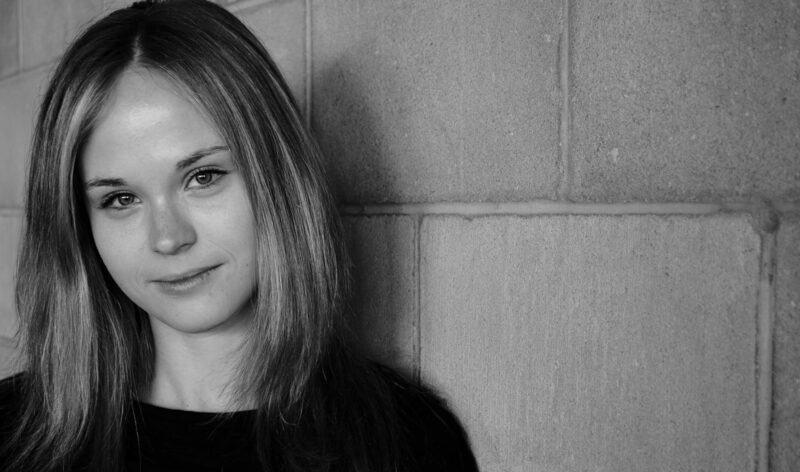 Both the Voices of Youth Count in-depth interviews and a number of prior studies suggest that at least some pregnancies among young women experiencing homelessness are intended. Future research should explore how young women experiencing homelessness think about becoming pregnant and the implications of their perspectives for pregnancy prevention. Data from our brief youth survey indicate that some young parents experiencing homelessness had their children with them. Specifically, 32% of the young women ages 18 to 25 years old and 8% of the young men ages 18 to 25 years old reported having physical custody of at least one child. Our national survey data indicate that 43% of the 18- to 25-year-old young women and 29% of the 18- to 25-year-old young men who had experienced homelessness in the past year were parents who had an average of two children. 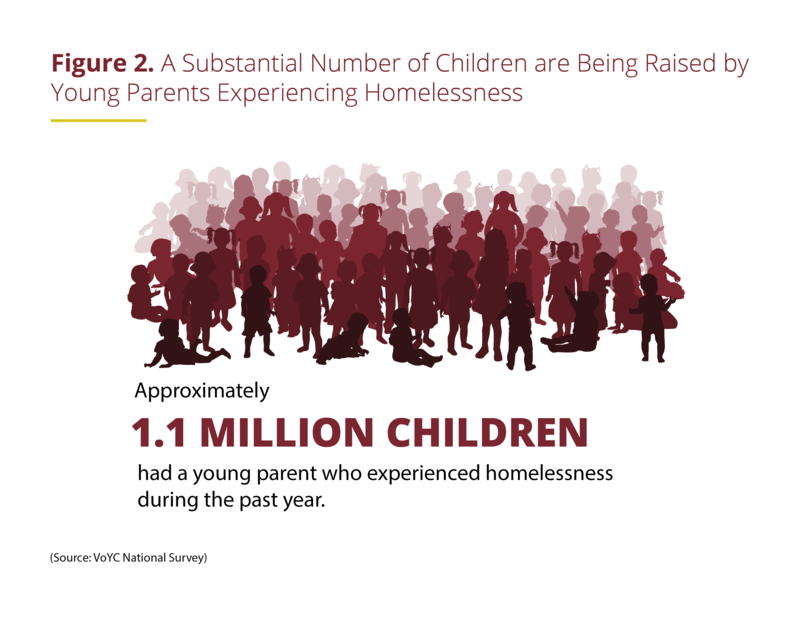 Based on these estimates, approximately 1.1 million children have an 18- to 25-year-old parent who experienced homelessness during the past year. Some of these 18- to 25-year-olds might not have been parents at the time they were homeless, and some might not have had been homeless with their children. Even so, it would appear that hundreds of thousands of children with young parents are homeless in America every year. A growing body of research shows that prolonged experiences of instability during early childhood can have adverse developmental consequences. Connecting young parents experiencing homelessness with “two-generation” programs that can address both their needs and the needs of their children is critical. The federal government has already taken several steps to promote these connections. The Improving Head Start for School Readiness Act of 2007 specifies that children experiencing homelessness are categorically eligible for Early Head Start (which serves children ages birth to 3) and Head Start (which serves 3- and 4-year-olds) and requires programs to prioritize children experiencing homelessness for enrollment. Although there are no comparable provisions in the Maternal, Infant, and Early Childhood Home Visiting Program (MIECHV) reauthorization legislation, HHS has distributed guidance to MIECHV grantees on how to provide services to families experiencing homelessness. Communities should ensure that young parents and children experiencing homelessness are being served by these programs. Additionally, the U.S. Departments of HHS, Housing and Urban Development (HUD), and Education (Ed) issued a joint statement on meeting the needs of families experiencing homelessness with young children. This statement calls for stronger partnerships between homeless service providers and a wide range of programs that can address the developmental needs of young children and their families. These partnerships could be expanded at the community level in many ways. Communities can engage early childhood providers in their Continuums of Care and encourage homeless service providers to refer young parents and their children to early childhood programs. Some Head Start and Early Head Start programs already incorporate screening for homelessness and housing instability into their intake and assessment procedures. Early childhood providers could reach out to homeless service providers to share information about programs for which families experiencing homelessness might be eligible and ascertain what, if any, program adaptations might be needed to serve those families. Connecting young parents experiencing homelessness with “two-generation” programs that can address both their needs and the needs of their children is critical. Future research could explore the effectiveness of different strategies aimed at promoting collaboration across the various systems that touch the lives of youth experiencing homelessness who are pregnant and parenting and identify promising practices for the field. This increased openness to services is an opportunity for programs to engage and support pregnant youth, young parents, and their families. Voices of Youth Count in-depth interviews also indicate that a sizable number of young parents who are homeless do not receive the need-based benefits for which they and their children are likely to be eligible. Only 36% of the parents experiencing homelessness who were living with at least one child reported ever receiving TANF (Temporary Assistance to Needy Families), and 64% reported ever receiving WIC (Special Supplemental Nutrition Program for Women, Infants, and Children).3 Their rates of current benefit receipt were even lower; 23% were currently receiving TANF and 55% were currently receiving WIC. Additionally, 42% of the pregnant young women were current WIC recipients. Our findings highlight the intervention opportunities that may arise when youth experiencing homelessness are pregnant or parenting. Because pregnant and parenting youth experiencing homelessness also frequently rely on family members, services that support reunification with their families are critical. Service providers should explore whether family reunification may be an option or whether there are relationships with family members that they can help the youth (re)build. Service providers should also look for openings to engage pregnant or parenting youth in services that they might not have been ready to benefit from previously. This could include helping youth enroll in education or employment programs or connecting them with mental health or substance use treatment. It should also include helping youth who are pregnant and young parents find child care and apply for child care assistance so that they can participate in education, employment, or treatment activities. States could facilitate this process by including outreach to providers that serve young parents who are homeless in their HHS Child Care and Development Fund plans. Because our findings suggest that a substantial number of pregnant and parenting youth experiencing homelessness may not be receiving benefits, such as TANF and WIC, for which they are eligible, service providers should ask pregnant or parenting youth about benefit receipt as part of their routine intake process and refer nonrecipients to the relevant programs.4 Additionally, state or county agencies that administer these programs should work with homeless service providers to identify potentially eligible pregnant and parenting youth and streamline the referral and application process. Future research should focus on examining the effectiveness of different strategies for connecting pregnant youth and young parents experiencing homelessness with the services and supports they need, including identifying optimal points for engagement. Only 38% of the 142 homeless youth service providers who responded to the Voices of Youth Count provider survey reported that at least one of their programs serves youth who are parenting; 35% serve parents age 18 to 25 and 21% serve parents under age 18. Programs that serve minor parents are especially scarce in more rural counties. Young parents experiencing homelessness may also receive services from homeless family service providers. Although 80% of the 223 homeless family service providers we surveyed serve families in which the parent is 18 to 25 years old, only 16% serve families in which the parent is a minor and several of those providers only serve minor parents through street outreach programs. Our findings suggest that there are significant gaps in the availability of services for young parents who are homeless, particularly if those parents are minors or live in rural areas. One solution is for more homeless youth and family service providers to serve minor parents. Another solution is for more homeless youth service providers to serve parents who are young adults. Both solutions are likely to require some cross-training between providers that serve homeless youth and those that serve homeless families. Additional training could be provided by organizations that run adolescent parenting or early childhood programs. Homeless youth service providers could also use the assessment tool created by the Administration on Children and Families to ensure that shelter and housing programs are safe and developmentally appropriate for young children. Homeless service providers would need to comply with state licensing requirements related to serving minors if they begin to serve parents under age 18. States should consider streamlining the licensing process so that these requirements do not become a major barrier to serving minor parents who are homeless. Two other options that communities can use to better support pregnant or parenting youth experiencing homelessness are the Pregnancy Assistance Fund (PAF) and Second Chance Homes (SCH). The PAF is a competitive grant program administered by the HHS Office of Adolescent Health. Grantees provide supportive services (e.g., case management, referrals, parenting skills training) to pregnant and parenting teens and young adults in a variety of settings, including schools and community centers. SCH provide adult-supervised housing and supportive services (e.g., child care; transportation assistance; education, job training, and employment services; counseling; and parenting and life skills training) to pregnant teens, teen mothers, and their children. They are typically funded with TANF or Social Services Block Grant funds. Both PAF grantees and SCH could prioritize pregnant and parenting youth experiencing homelessness. Future research should examine differences between how homeless family and homeless youth service providers identify promising practices and meet the needs of young parents experiencing homelessness. Voices of Youth Count in-depth interviews indicate that some young parents struggled to obtain shelter or transitional housing because the homeless service providers in their community only served single mothers or married couples with children. This is illustrated by the story of Cassidy and John. Policies like these can force young parents to choose between maintaining a relationship that is important to them or obtaining shelter for themselves and their children. Homeless service providers should recognize the importance of relationships to all youth experiencing homelessness but particularly to youth who are pregnant or parenting. Voices of Youth Count systemic evidence review revealed that providers often fail to support relationships that are important to youth experiencing homelessness. One evaluation included in the review found that about a quarter of the young mothers in a community-based supportive housing program left the program and moved in with their boyfriends. This might suggest that maintaining the relationship with the boyfriend was perceived as more important than the program’s services and supports (especially when combined with any rules and restrictions the program imposed on participants). Homeless service providers should recognize the importance of relationships to all youth experiencing homelessness but particularly to youth who are pregnant or parenting. Providers should make a concerted effort to help maintain those relationships. They could do this by providing shelter not only to young women who are pregnant but also to their partners. They could also offer housing options that allow young parents to live with their child or children’s other parent or their current partner (as long as doing so does not pose a threat to their or their children’s safety). Not surprisingly, Voices of Youth Count national and brief youth survey data both suggest that young women are more likely to be homeless with children than young men. We don’t know if homeless service providers contribute inadvertently to this gender difference by not serving young fathers. Moving forward, homeless service providers should address the needs of young parents, regardless of their gender or marital status. They should also do a better job of engaging young fathers, regardless of whether they have physical custody, so that their needs, and, in turn, their children’s needs, can be addressed. Future research should focus on identifying practices that homeless youth and family service providers can implement to maintain—if not strengthen—the relationships that are important to young parents rather than seeing these relationships as a problem. Additional research is also essential to better understand the experiences of young fathers experiencing homelessness, their involvement in their children’s lives, and the types of supports they need. Our research also indicates that the risk for homelessness is high among youth who are pregnant or parenting. Several young women who participated in our in-depth interviews reported becoming homeless after becoming pregnant. They described their pregnancy as yet another source of conflict or cause for parental rejection in an already dysfunctional or abusive family. Although these young women eventually left or were kicked out of their homes, becoming pregnant was not the only reason they became homeless. Additionally, our national survey data indicate that the relative risk of experiencing homelessness during the past year was significantly higher for 18- to 25-year-olds—both male and female—who had children than for their nonparent peers.5 Although we don’t know if the 18- to 25-year-old parents were already parents when they became homeless, these data could indicate that young parents are particularly vulnerable to experiencing homelessness due, in part, to the increased stressors and challenges they face as parents. Our findings point to the importance of intervening to prevent homelessness among pregnant and parenting youth. School personnel, health care professionals, and other service providers who work with pregnant and parenting youth could routinely ask about the stability and safety of their living arrangements, other risk factors for homelessness, and any unmet needs. Once assessed, youth could be referred for appropriate services that might include family-based interventions, housing programs, or other types of support to help them care for themselves and their children. Future research should identify valid and reliable screening tools that school personnel, health care professionals, and other service providers who work with pregnant and parenting youth can use to assess their risk for homelessness. Missed Opportunities: Pregnant and Parenting Youth Experiencing Homelessness offers insights from data collected using different research methods and from different sources about homelessness among pregnant and parenting youth. These data indicate that a substantial percentage of youth experiencing homelessness are pregnant or parents and that many of the young parents are experiencing homelessness with their children. When we reach out to pregnant and parenting youth experiencing homelessness, we can have a positive impact on two generations. Every pregnant or parenting youth experiencing homelessness has a unique story. However, they face many common challenges. Like youth experiencing homelessness more generally, they need services and supports that promote stable housing, permanent connections, education or employment, and social-emotional well-being. However, those services and supports must be tailored to the individual needs of the youth. Some young parents experiencing homelessness are capable of independent living and only need time-limited housing assistance to achieve stability; others require substantial and ongoing support to learn how to live and parent independently. When we reach out to pregnant and parenting youth experiencing homelessness, we can have a positive impact on two generations. By addressing the needs of young parents who are homeless, we also help them provide their children with stability. Addressing these needs will require a concerted effort on the part of homeless service providers, other practitioners, and policymakers. It also requires actionable research to guide policy and practice. Failure is not an option. 1. Kost, K., Maddow-Zimet, I., & Arpaia, A. (2017). Pregnancies, births and abortions among adolescents and young women in the United States, 2013: National and state trends by age, race and ethnicity. New York, NY: Guttmacher Institute. 2. The Child Find provision in the Individuals with Disabilities Education Act requires states to identify and evaluate all children with disabilities, including children who are homeless, who may need early intervention services. 3. The percentage of young parents who were receiving or who had received benefits might be higher than these figures suggest, particularly since each state has a unique name for its TANF program. 4. Minor parents may receive their own TANF assistance grants if they meet certain eligibility criteria. They must be participating in education or training activities if they have not completed high school and must be living with a parent, legal guardian, or other adult relative or in a state-approved adult-supervised supportive living arrangement. 5. This effect persisted even after controlling for other factors that might explain why being a parent might increase the risk for homelessness among young adults. This brief is the result of a collaboration between Voices of Youth Count, based at Chapin Hall at the University of Chicago, and many partners. The authors wish to acknowledge important contributions from Elizabeth Dierksheide, Anne Farrell, Leah Gjertson, Beth Horwitz, Melissa Kull, Marrianne McMullen, Sonali Patel, and Bryan Samuels, as well as the methodological and technical expertise provided by the Voices of Youth Count Technical Advisors. Data collection for the national survey and follow-up interviews was conducted by Gallup, Inc. alongside of its U.S. Politics and Economics Daily Tracking Survey. Professional services were provided by Bowerbird Communications and Forum One. Dworsky, A., Morton, M. H., Samuels, G. M. (2018). Missed opportunities: Pregnant and parenting youth experiencing homelessness in America. Chicago, IL: Chapin Hall at the University of Chicago.